avail us little to solve all others." The Theodore Roosevelt Papers from the Manuscript Division of the Library of Congress constitute one of the Library's largest Presidential collections, numbering approximately 250,000 items. The collection includes diaries, letter books, general and special correspondence, speeches, executive orders, press releases, scrap books, and other papers dating from 1759 through 1919. Plans for the future digitization of this collection are still being made. presence on the once wide open spaces. Lt. Col. Theodore Roosevelt was famous for the heroics of his Rough Riders on San Juan Hill during the Spanish-American War. 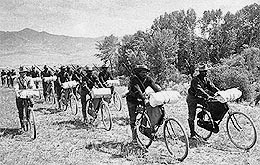 Troopers who went to Cuba first made bicycle history in the West. On June 14, 1897, Lt. James Moss led his bicycle corps of the 25th Infantry from Fort Missoula, Montana 1,900 miles up wagon trails and Indian paths and down railroad grades to St. Louis, Missouri, arriving July 16, 1897. 1905 President Roosevelt transfers management of the federal forest reserves to the United States Forest Service, an agency headed by college-trained conservationist Gifford Pinchot. Invoking scientific principles and applying bureaucratic procedures, Pinchot works effectively to guarantee the long-term usefulness of western timberlands, resisting business interests that would exploit them for short-term profit as well as preservationists, led by Sierra Club founder John Muir, who would remove them forever from the national economy. except by Act of Congress. The Siuslaw National Forest is one of 21 created by President Theodore Roosevelt's executive orders on July 1, 1908 when he sidestepped a Congressional attempt to limit his ability to create and enlarge parks and forests. Today, the Siuslaw includes 630,395 acres. America's conservation President set aside more than 230 million acres of land as 150 national forests, 51 federal bird reservations, 4 national game preserves, 5 national parks, 18 national monuments and 24 reclamation projects. Roosevelt established 15 National Forests in Oregon by executive order between March 1, 1907 and February 13, 1909. The Siuslaw combined the Tillamook Forest Reserve and acreage from the Umpqua Forest Reserve. Today, the U.S. Forest Service manages 15,658,000 acres in 13 Oregon National Forests. One of his first executive orders established Crater Lake National Park in 1902. The forest reserves of the United States quadrupled to about 194,000,000 acres under President Roosevelt's orders, equal in area to all the states on the Atlantic coast from Maine to Virginia and the states of Vermont, Pennsylvania, and West Virginia. This is a greater area than France, Belgium, and The Netherlands combined. On February 1, 1905, President Roosevelt transferred the Division of Forestry to the Department of Agriculture from the Department of the Interior. 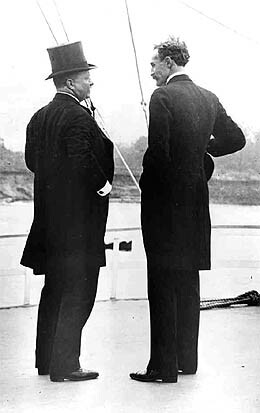 Gifford Pinchot was appointed as the first chief of the new agency, the United States Forest Service. "While the Agricultural Appropriation Bill was passing through the Senate, in 1907, Senator Fulton, of Oregon, secured an amendment providing that the President could not set aside any additional National Forests in the six Northwestern States. This meant retaining some sixteen million of acres to be exploited by land grabbers and by the representatives of the great special interests, at the expense of the public interest. "But for four years the Forest Service had been gathering field notes as to what forests ought to be set aside in these States, and so was prepared to act. It was equally undesirable to veto the whole agricultural bill, and to sign it with this amendment effective. Accordingly, a plan to create the necessary National Forest in these States before the Agricultural Bill could be passed and signed was laid before me by Mr. Pinchot. I approved it. The necessary papers were immediately prepared. I signed the last proclamation a couple of days before by my signature, the bill became law; and when the friends of the special interests in the Senate got their amendment through and woke up, they discovered that sixteen million acres of timberland had been saved for the people by putting them in the National Forests before the land grabbers could get at them. "The opponents of the Forest Service turned handsprings in their wrath; and dire were their threats against the Executive; but the threats could not be carried out, and were really only a tribute to the efficiency of our action." Over Roosevelt's articulate objections, "An Act Making appropriations for the Department of Agriculture for the fiscal year ending June thirtieth, nineteen hundred and eight," H.R. 24815, Public Act No. 242, U.S. Congress. 59th. 2nd Session was passed on Feb. 25, 1907. Unwilling to pocket-veto the entire appropriations act, Roosevelt permitted Gifford Pinchot and his staff to identify some 16,000,000 acres of forest in Oregon, Washington, Idaho, Montana, Colorado and Wyoming, which the President then designated as new national forest lands by executive order, between Congress's passage of the bill and its signing on Marth 4th by the reluctant President, who was now forbidden to create or enlarge the newly designated National Forests. Roosevelt's successor, President William Howard Taft, approved the consolidation of the Umpqua National Forest with the Siuslaw in his Presidential proclamation of June 30, 1911. In 1912, California was added to the list of states in which additional national forests were forbidden without Congressional approval. further reading and more . . .
T.R. & The Scorcher Squad . . . how T.R. made the Big Apple safe from  and for  bicycles in 1895.